Altus, Inc. | To Power or Not to Power? That is the Question! When does it make sense to use a powered medical cart and when is a non-powered laptop cart ‘good enough’? Do you use an EMR for data entry and documentation? Do you need your carts to be mobile and not tied to a wall plug? Do you need continuous power to ensure your computer and accessories last an entire shift? Answered yes to one or all of these questions? Then a powered mobile workstation is the best option for you! 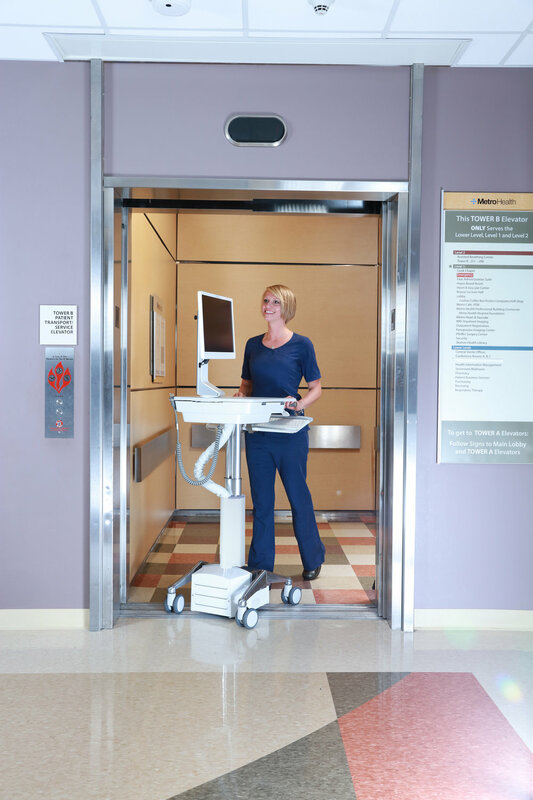 If you and your staff are mobile, moving from patient room to patient room, then an Altus powered medical grade cart on wheels is the right solution for you. Clio’s lightweight performance LiFePO4 (Lithium Iron Phosphate) battery technology is the most durable, reliable and safest battery technology available. Altus powered technology workstations deliver point of care for caregivers in a simple yet effortless way. Whether sitting or standing, patient interaction is facilitated through this family’s calming aesthetic. Altus re-establishes the standard for powered carts. An onboard battery allows you to power your technology components without continuously plugging into the wall. With a 14 hour (based on constant 30-40W output) runtime. You’ll be able to last an entire shift without needed to keep the cart stationary to charge. When you do need to plug in the cart, you can maintain an uninterrupted workflow using onboard charging through wall outlet power. The system powers both the technology components and recharges the battery simultaneously. With a 10 Amp charger, your cart's battery can be charged within 2 hours, keeping you running while you recharge. Powered carts put the convenience of a wall plug at your fingertips with the flexibility and convenience of mobile carts. When are powered carts overkill and non-powered carts work just fine? Can you plug in your laptop or computer every few hours? Do you have downtime to let your computer charge? Does your laptop’s power last your entire shift without needing to be charged? If you answered yes to the above questions than it might make more sense for you to go with a non-powered mobile Altus computer cart. Altus’ non-powered mobile computer workstation family bring beauty, strength, and performance to mobile medical carts. These carts help caregivers deliver point of care in a simple yet effortless way. Whether sitting or standing, patient interaction is facilitated through effortless adjustability and mobility. Altus re-establishes the standard for non-powered carts.